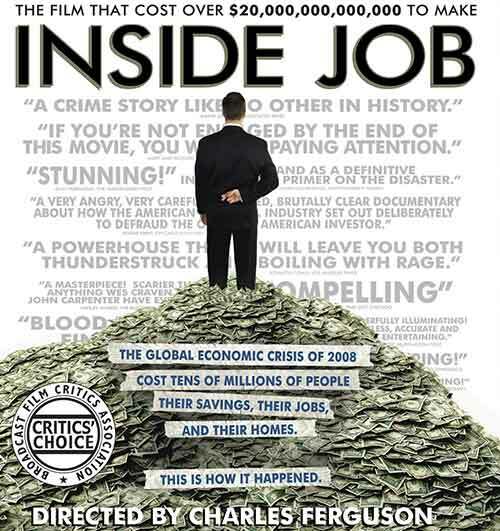 The Sony Pictures documentary Inside Job says the 2008 meltdown of world financial markets was avoidable. 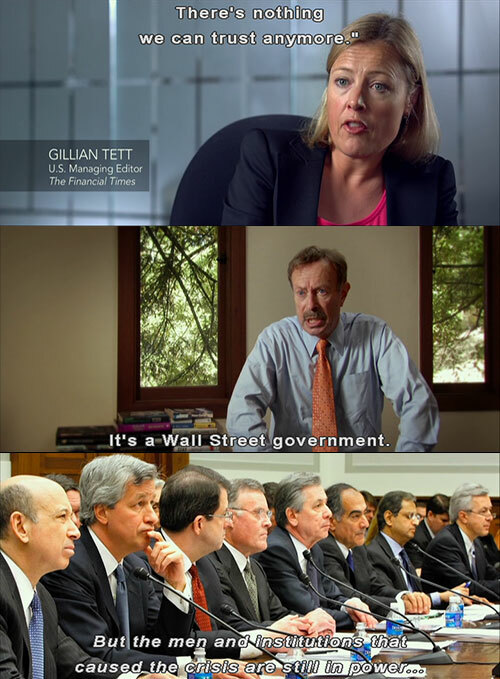 The global financial crisis of 2008 was an “Inside Job” that led to a global economic recession, millions of people losing their jobs, savings and homes and huge increases in government debt in order to pay for corporate bailouts. The main perpetrators in the property, banking, financial industries not only got off without being charged but many got bailed out of losses with taxpayers money. Now towards the end of 2011 the world stands on the brink of GFC2 as European nations struggle to cope with their debt burdens and the USA has what is known as a “U6” under/unemployment rate of 16.5%. Excessive salaries, cash bonuses and stock options given to financial services industry staff and CEO’s – Failed CEO’s are often given millions in bonuses and compensation rather than being sacked. The New York Times has a good infographic about executives of seven major American financial firms that have either collapsed, were sold at low prices or have received taxpayer-funded bailouts. Prominent Economists Had Huge Conflicts of Interest – they were key players in financial services deregulation but also earnt a substantial portion of their personal income from directorships, advisory posts and consultancy work for banks, insurers etc. Read the comments at this Financial Times article to see what I mean. Loans Were Given To People Who Couldn’t Pay Them – NINJA loans are one example (No Income No Job or Asset). NPR produced a special show called Giant Pool of Money that explained what the American housing crisis has to do with the turmoil on Wall Street and why banks made half-million dollar loans to people without jobs or income. Finance Industry “Owns” Government – There is an old saying that “He who pays the piper calls the tune”. In the USA the financial industry is one of the key financiers of political campaigns and “owns” politicians on both sides, Democrats and Republicans. In Australia it is commonplace for former politicians to work for the financial industry as staff or consultants such as the ex-NSW premier Bob Carr. Since then Macquarie has made an art of poaching politicians – former Victorian treasurer Alan Stockdale, to the colourful ex-member for Parramatta, Ross Cameron, to the controversial appointment of former premier Bob Carr earlier this year. The current level of belief that politicians and governments work in the public interest is abysmally low as more and people have realised that politicians are beholden to the corporations like banks and mining companies that help finance the cost of their election campaigns. This sounds like a really interesting film to watch, it all sounds very NWO (New World Order) to me! I agree NWO (New World Order)!